McLean & Company takes you through all the steps required to effectively act on employee feedback and improve engagement. 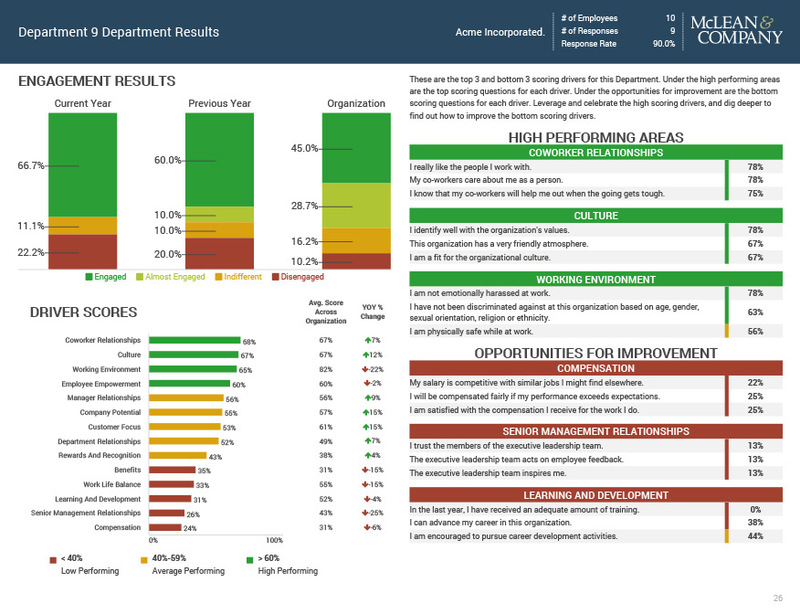 A report that provides an overall breakdown of your organization’s engagement results and engagement driver results. Organizations with strong employee engagement are more productive. 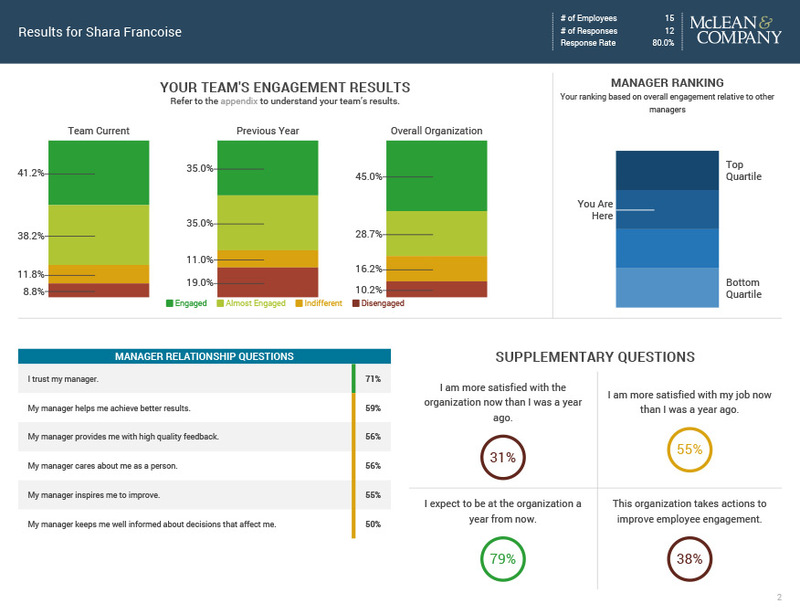 Rather than guessing how engaged your employees are, get a comprehensive view of your organization’s engagement levels. 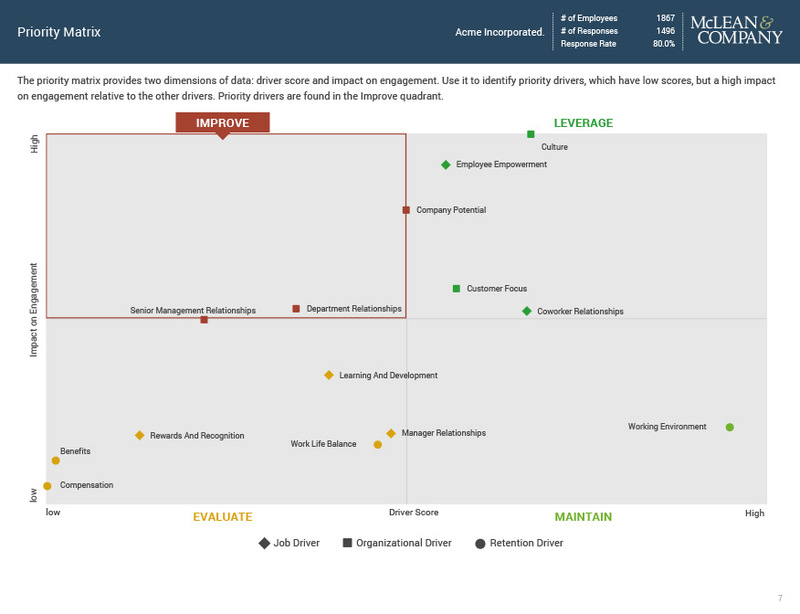 By correlating engagement scores with driver scores the Priority Matrix identifies which drivers have the greatest impact on your organization’s engagement levels. A report that provides a breakdown of engagement results for each demographic. Results specific to each manager provides key engagement metrics for managers with a sufficient employee count. McLean and Company can guide you through these phases. Through analyst calls and research based solution sets, we can provide advice each step along the way. with McLean & Company’s facilitated Employee Engagement Action Planning Workshop. Dig deeper to get your employees’ perspectives on what’s working, what’s not, and how to improve it. After we facilitate focus groups to gather employee feedback, we’ll work with your HR team and the greater executive team to build action plans that are meaningful to your employee’s engagement. We’ll come onsite and be hands on with you.